Key Projects | DoubleDragon Properties Corp. 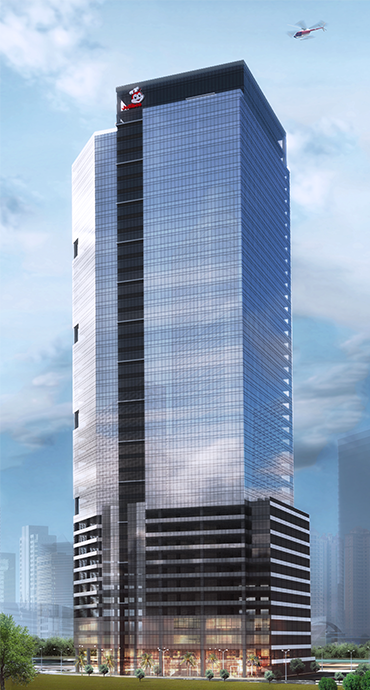 This premium Grade A 41-storey commercial and office tower is poised to become a prominent landmark in the Ortigas Central Business District by 2018. Situated on a 3,002 square meter prime commercial lot located at the corner of F. Ortigas Jr. Road (formerly Emerald Avenue) and Garnet Road, Jollibee Tower will complement the thriving business community in the Ortigas Area. Offering over 55,000 square meters of leasable space by 2018, Jollibee Tower features ground floor food concepts and a drive-thru provision as well as an events center. The rest of the floors will be leased as office space and will include sufficient parking to service tenant requirements. The tower will be designed as a Grade A structure and is expected to secure Leadership in Energy and Environmental Design (LEED) certification in line with DoubleDragon’s core values in promoting sustainable developments through “green” technology. The exterior of the building will be made of double-glazed glass curtain walls for increased energy efficiency. Construction is in full-swing since its ground breaking last March 7, 2016 while completion is targeted within 2018. Jollibee Tower is a joint venture project between DoubleDragon Properties Corp. and Jollibee Foods Corporation. Its modern building features and amenities will bring renewed innovation in the area. The construction of Jollibee Tower was awarded to Monolith Construction who is one of the largest construction firms in the Philippines. They will be working hand-on-hand with Architect Siao Ling & Associates who is one of the most familiar with high rise tower buildings. The project will be overseen by DCI who is also the same group managing the construction of DD-Meridian Park. We all look forward to the successful completion of this project which is set for 2018.